Have you spent time at the art supply store wishing you could buy every paint colour on the shelves? Most manufacturers produce a huge range of colours (120 or more), to encourage you to think you need them all to achieve the best results. Throughout the centuries, master artists such as Da Vinci, Monet and Picasso have proven a limited palette of just 21 colours can be more successful! To make choosing colours easier, Ardak Kassenova, professional artist and co-founder of ZenART, began creating limited palettes for specific purposes. With her extensive understanding of colour and colour mixing, she contacted other artists and researched the colours master artists used to create the paintings we love so well. Finally, she tested each colour in the three Infinity Palettes (Essential, Impressionist and Portrait) to make sure they mixed well with the other colours. Limited Palette for Infinite Harmony - this method helps achieve colour harmonies by utilizing more mixes than a variety of tube colours. Each set of 8 colours has a specific purpose; none of the colours are duplicated (except for the white); and they can be used to create your own unique palette. 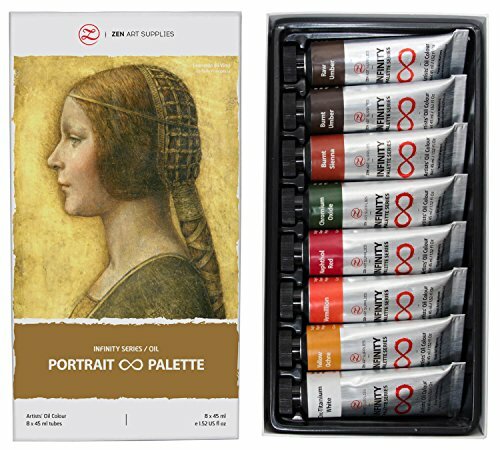 PORTRAIT PALETTE - includes Earth Colours to achieve realistic skin tones from the darkest brown to the lightest hues, but are not limited to figurative paintings. 8 (1.52 fl oz) tubes: Zinc-Titanium White, Yellow Ochre, Vermillion, Naphthol Red, Chromium Oxide, Burnt Sienna, Burnt Umber, Raw Umber. Combine with colours from the Essential and/or Impressionist palettes to create landscapes, seascapes, still life, etc! 1-year, 100% money back guarantee! Excellent customer service is the cornerstone of ZenART. If you are not 100% satisfied with any of our products, contact us and we will make it right. ✅ PROFESSIONAL GRADE OIL PAINTS FOR ARTISTS - designed with the artist's needs in mind, and made of only the finest non-toxic pigments which produce the best colour mixtures. Our paints have a high level of lightfastness, meaning they won't fade when exposed to light. ✅ LIMITED PALETTE FOR INFINITE HARMONY - great masters have proven this method is successful while bringing a greater balance throughout your painting. The PORTRAIT PALETTE includes Earth Colours to achieve realistic skin tones, but is not limited to figurative paintings. ✅ FINELY MILLED BUTTERY CONSISTENCY - Our smooth, buttery oil paints are easy to mix, and dry to a vibrant satin finish. The thick consistency of ZenART colours can retain brush or palette knife marks or it can be thinned to the very finest glazes. ✅ ZenART REINVENTS YOUR PALETTE WITH THE INFINITY SERIES - Highest Quality Pigments, Non-Toxic, thick and creamy. High pigment load for the coverage and clarity of colour you expect from a high quality artist's oil painting set. We only sell the highest quality oil paints. ✅ CONFORMS TO THE TOUGHEST INTERNATIONAL CERTIFICATION STANDARDS - Toxic pigments are substituted with non-toxic versions because your health and environmental safety are our top concern. And, we offer a 1-year, 100% money-back satisfaction guarantee on all of our products. View More In Arts & Crafts Supplies. If you have any questions about this product by ZenArt Supplies, contact us by completing and submitting the form below. If you are looking for a specif part number, please include it with your message.